A recent Ukrainian law condemning the Communist and Nazi regimes poses a threat to freedom of expression and free media, the European security and human rights watchdog has said. The Ukrainian law, “On condemnation of the Communist and Nazi totalitarian regimes in Ukraine and banning of propaganda of their symbols” was slammed by OSCE (Organization for Security and Cooperation in Europe) representative on freedom of the media, Dunja Mijatovic, in a statement on Monday. “It is discouraging for freedom of expression and media freedom advocates that the law has gone into effect, despite various calls to safeguard these basic rights,” Mijatovic said. According to the OSCE representative, after the legislation was adopted by the Ukrainian parliament on May 9, she wrote to President Petro Poroshenko asking him to think carefully before adopting it. 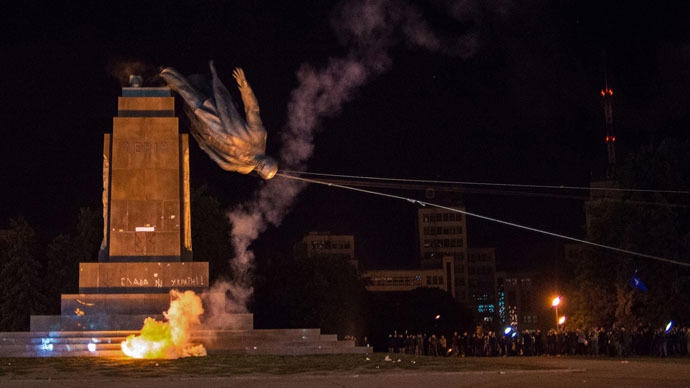 However, Mijatovic’s call was ignored and on May 15 Poroshenko put his signature to the law, which criminalizes approval of the activities of the Communist and Nazi regimes in Ukraine and bans all their symbols. The law envisages prison sentences of five to 10 years for violations, and media outlets could be punished with termination. “While I fully respect the often sensitive and painful nature of historical debate and its effect on society, broadly and vaguely defined language that restricts individuals from expressing views on past events and people, could easily lead to suppression of political, provocative and critical speech, especially in the media,” Mijatovic said. She also commented on another law, “On the legal status and honoring of fighters for Ukrainian independence in the twentieth century,” which was also signed by Poroshenko on May 15. 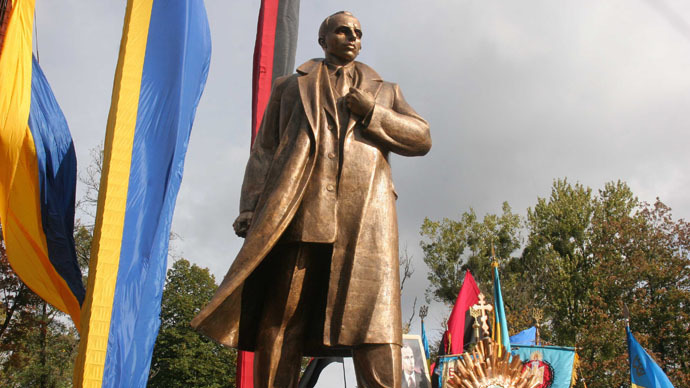 The legislation officially recognized Ukrainian nationalists, who collaborated with the Nazis during World War II, saying that members of the Organization of Ukrainian Nationalists (OUN) and the Ukrainian Insurgent Army (UPA) fought "for the country's independence" and are entitled to receive social benefits. It also outlawed public expressions of disrespect to these militant groups and criminalized the denial of Ukraine’s fight for independence in the 20th century. “The media is a vital element of a healthy democracy and its role should be respected at all times. Contested information and potentially problematic speech should not be banned, on the contrary, it should be addressed through an open debate,” Mijatovic stressed. “Disproportionate restrictions on media freedom can never be justified in a democratic state and Ukraine’s significant progress in this area should be preserved, not undermined,” she added. The OSCE representative also expressed regret that the controversial laws were introduced by Ukraine without any public discussion. The Ukrainian authorities have recently been making vigorous efforts to break away from the Soviet past, which links the country with Russia. This included rethinking the way the country marks Victory Day over the Nazis, which spanned two days in the country this year. The Day of Remembrance and Reconciliation was introduced on May 8 to celebrate the end of World War II with the rest of Europe, while May 9 – traditionally celebrated as the Victory Day in Russia and other post-Soviet states – went ahead without the usual military parade and fireworks.